A mark of true athleticism is the ability to exert maximum effort while making the result look graceful and unforced. 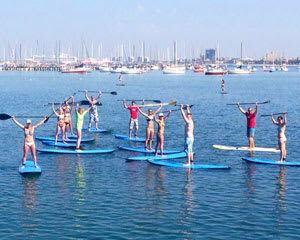 That's what stand up paddle boarding is all about: from a distance, the sport looks perfectly effortless and graceful. 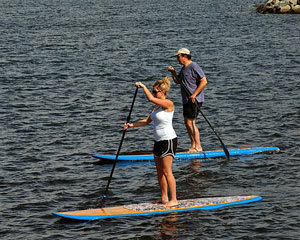 But for the paddler, it's a full-body workout that requires balance and agility. Combining traditional paddle boarding and surfing, stand up paddle boarding, also known as SUP, is currently the fastest growing water sport in the world. There’s a reason why—grab a paddle and find out for yourself! While it might be intimidating at first to see folks serenely paddling by you, seemingly walking on water, it's surprisingly easy to learn stand up paddle boarding. Start your SUP lesson by becoming familiar with the stances, paddling maneuvers and turning techniques. Your instructors are SUP experts and will teach you all the right tricks that keep you from wobbling over as you ply the water. For your first few tries, you can begin in a kneeling position (it’ll help you understand the rhythm of the sport). Then, once you’re comfortable, raise your body and put the “SU” in SUP! After a splash or two, you'll get the hang of it. 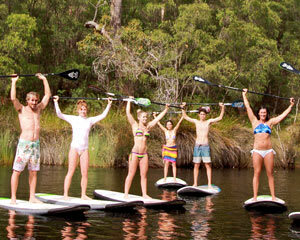 Bring your mates along and learn together during group SUP lessons. 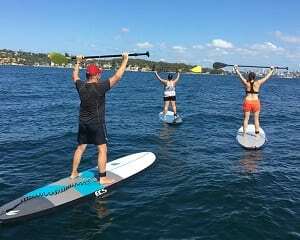 Or if you're getting serious about stand up paddle boarding, check out the private SUP lessons available for perfecting your technique (have you ever seen advanced paddlers doing yoga and Pilates on their boards? 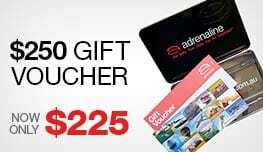 This could be you)! 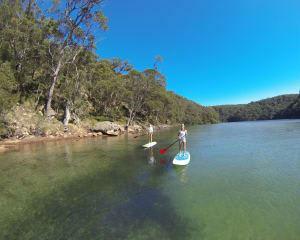 And once you've got a lesson or two under your belt, strike out on your own with a stand up paddle board hire. 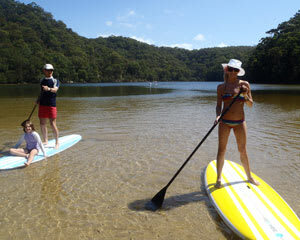 The unobtrusive nature of stand up paddle boarding makes it an ideal method for observing wildlife. On a guided SUP tour, you'll receive instruction in paddle boarding technique (beginners are welcome—no experience necessary!) before taking off on your adventure. 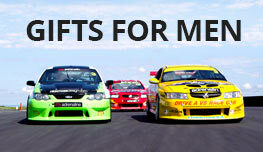 Wildlife eye-candy ranges from kangaroos to bottlenose dolphins! The takeaway from each of these stand up paddle boarding experiences is generally the same: “I can't wait to try it again!” Whether you choose to zen out in nature or amp up the adrenaline with some SUP racing and acrobatics, stand up paddle boarding promises big smiles every time!